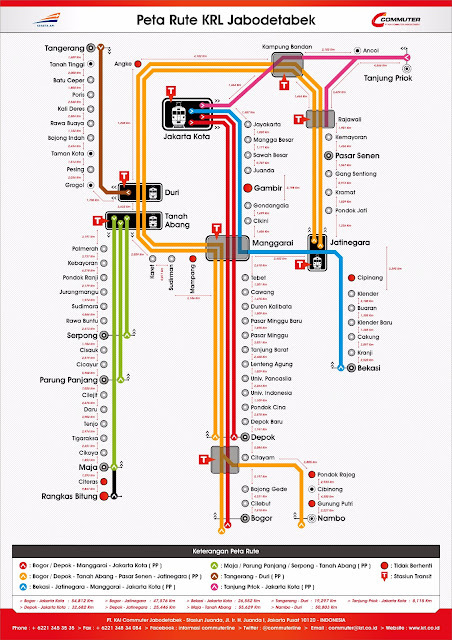 ^_^: Bekasi Residents The Victim Of Commuter Line's Ever Changing Route Policy? Bekasi Residents The Victim Of Commuter Line's Ever Changing Route Policy? OK, so the post title was probably a bit overly dramatic. But I have my own reasons. As of April 1, 2017 (and no, it's not an April Fools joke), eight of the Commuter Line trains serving Bekasi-Kota route will use the Bekasi-Jatinegara-Pasar Senen-Kota track. They say (you can read the the news here) that the change of route was aimed to relieve crowding at Manggarai station. The eight rerouted trains are the 5:38 a.m., 8:21 a.m., 12:48 p.m. and and 3:14 p.m. from Bekasi station and the 7:05 a.m., 10:06 a.m., 1:57 p.m. and 4:46 p.m. from Jakarta Kota station. The company said that in the future, they would reroute all Bekasi-Kota trains to the aforementioned track. But there is no mention of a solution to passengers who need to hop off along the Manggarai-Gambir-Jayakarta leg. Bekasi-Kota trains can use two tracks: (1) Bekasi-Jatinegara-Manggarai-Gambir (not stopping though)-Kota, (2) Bekasi-Jatinegara-Pasar Senen-Kota. In the past (I'm talking about the train service in late 1990s and early 2000s here), there were CL trains for track no. 1, no. 2 (which is brought back to life this month) and...Bekasi-Tanah Abang (no longer exists). People working in Sudirman area could take the Bekasi-Tanah Abang without having to transfer in Manggarai station. Then, the train company decided to stop trains going on track no. 2 and the Bekasi-Tanah Abang. Now, the company decided to resuscitate track no. 2. This is a lesson learned the hard way for the train company: don't stop/create a new track without holding a proper feasibility study. Otherwise, you'll end up with crowding issue. Back to the crowding, here's the situation: Bekasi train track is also used by intercity trains (read: trains going to West Java, Central Java and East Java), and perhaps every 10 minutes, a Commuter Line train will have to wait for an intercity train zooming past the track in order to pass. Crowding? Oh yeah, be a Bekasi-based Commuter Line passenger, and you'll know what it feels to wait for intercity trains to pass. That's a real crowding issue along the track. A construction work to build the double-double track between Manggarai and Cikarang is underway, but it's a long railway track, and the progress goes in a snail's pace. The double-double track construction not only builds the tracks, but also stations as some stations will have to be relocated to give way to the tracks. To compensate the decision, the train company has provided the Jatinegara-Duri-Jatinegara trains and the Manggarai-Duri feeder trains, which picks up passengers in Manggarai station every 30-45 minutes. It is not frequent enough. But it is still much better than being squeezed in Bogor-Tanah Abang or Jatinegara-Duri-Jatinegara trains. Bekasi residents working in Sudirman area or those wanting to go to Tanah Abang didn't have any choice but to accept the decision. If all Bekasi-Kota trains are rerouted to track no. 2, then Bekasi people working in Sudirman area (people like me) have to transfer in Jatinegara and use Jatinegara-Duri-Jatinegara train, which will reach Sudirman in one hour, or hop off at Pasar Senen station and continue with TransJakarta bus, which will be caught in the jam, that's for sure. Another issue is Bekasi-bound trains are still a rarity, perhaps only one train consisting of 8-12 cars coming every 20 minutes or so, unlike Bogor-bound trains that usually have 10-12 cars coming every 5-10 minutes. Check the pic above. Notice that there are two lines going through Bogor station, four through Depok station, while there is only one line from Bekasi station? Who's causing the crowd? Bogor and Depok. And who's paying the price? Bekasi. Hmphh. In terms of number of passengers, Bogor-based passengers are definitely a bigger crowd than Bekasi-based passengers, but the train company shouldn't play favorites. Bekasi residents are also part of the devoted members of Commuter Line congregation. We are of small number, but this small number taking the Commuter Line has reduced the road traffic. Or perhaps the train company wishes Bekasi people to take up a stand, buy private cars and fill up the roads to Jakarta? Dear train company, stop messing with our train schedules. Instead of rerouting the existing trains, why don't you allocate more trains for Bekasi-based passengers? PS. My previous post on the struggle to reach office is here. Bole gw share di fesbuk ga ini? wkwkwk, bikin petisi online yuk. duh bahasa inggrisnya masih berantakan ini.